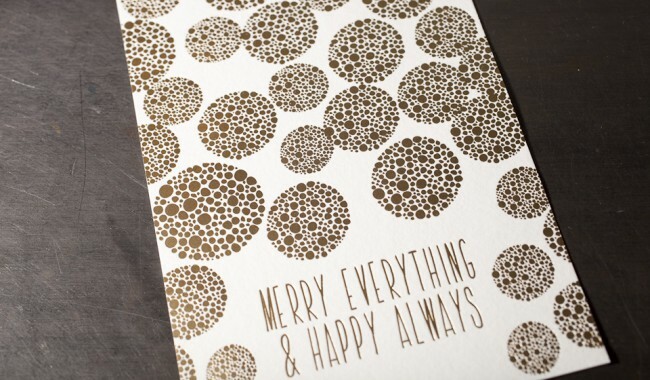 Is your design good for foil stamping? 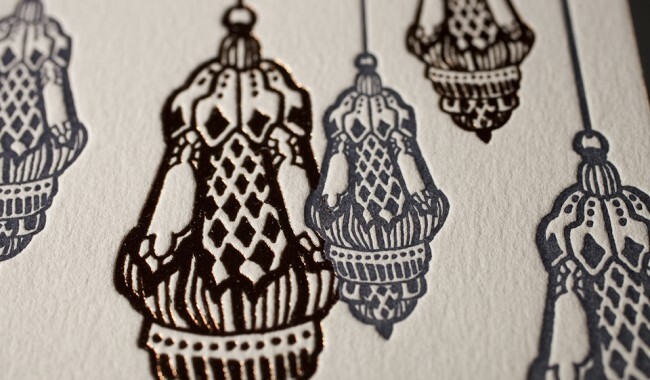 Print quality: artwork suitable for letterpress printing generally prints well in foil stamping. We’ve done extensive testing with our foil dies to maximize our printing quality, and the type of foil that we use creates beautiful images with clean release. A few differences to note from letterpress though: many of our foils are completely opaque with no show-through of paper (Pearl Shine foil is not completely opaque); art and type tends to look thicker or bolder in foil stamping, especially on thicker papers; and thin reverses tend to fill in more on foil stamping. If your piece is larger than 50 square inches: please send for review so we can make sure our presses can handle the impression. 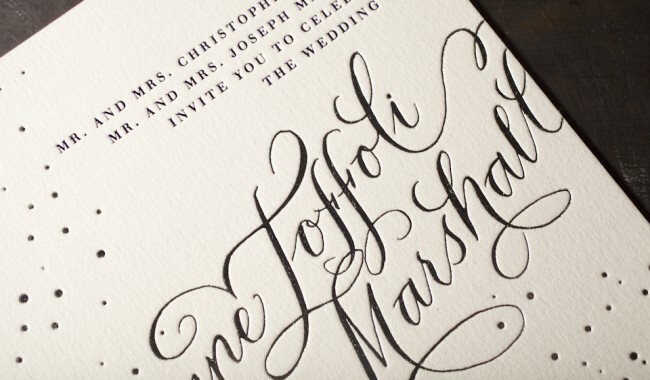 Foil envelopes look beautiful with foil stamping. We can print on the back flap (as long as the image is contained in the designated print area on our envelope templates) and on the front of the envelopes. We cannot print bleeds on envelopes. See our envelope templates for printable areas. Scoring and folding: folded pieces can have foil stamping, but the foil coverage can’t go over the score. Allow a minimum of 1/8” clearance between the foil and the score. 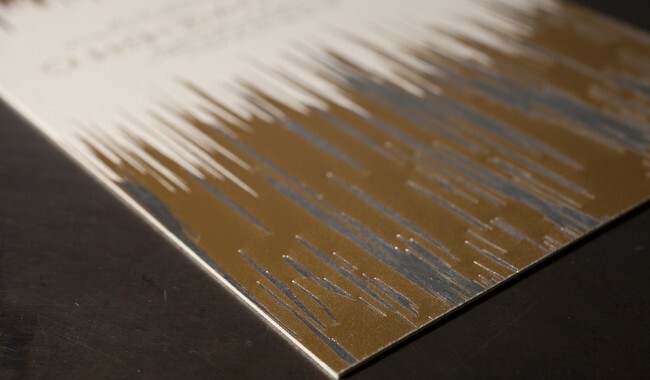 Edge painting, foil edging, and bleeds: if your foil-stamped design has a bleed greater than 1/8″ wide, we won’t be able to use edge painting or foil edging. If you want to use these embellishments, keep a 1/8″ foil-free margin around all sides of the piece. An example of a foil bleed we cannot edge paint. An example of a foil bleed that we can edge paint. Double-sided printing (with foil stamping on both sides): in many situations we’re able to foil stamp on both sides of a card, but this does depend on the paper and the amount of coverage in the artwork. If you’re printing on a 1-ply paper (under 30 pt. ), have us review artwork beforehand so we can see if double-sided foil stamping is possible for your job. 2-ply stock (over 30 pt.) will generally work, though we’ll need to minimize the impression depth on both sides. Heavy coverage on the double-sided printing, such as all-over back patterning in foil, is not possible without duplexing. 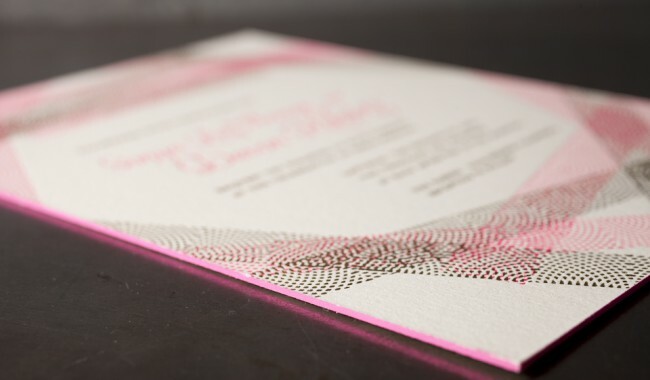 Double-sided printing, foil over letterpress: we can generally print foil stamping on one side and letterpress on the opposite side. When the artwork on one side backs up the artwork on the opposite side, we will minimize the impression depth. 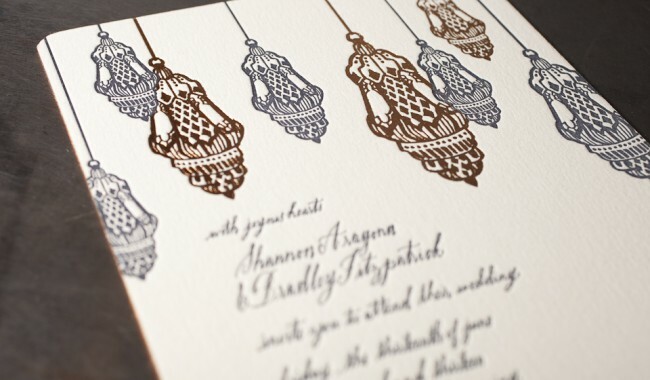 Foil colors on dark stock: foil stamping is opaque, which makes a light foil over a dark paper possible. Custom foil colors: new foil colors outside of the foils we stock require extensive testing on our various papers, so we generally don’t offer custom colors. If you have a special color need though, let us know and we’ll see what we can do. Minimum font size: 8 pt for most fonts. Font weight, fine scripts, and thin fonts: typefaces generally appear a little bolder when foil stamped. Thin fonts can be used, but if the font has very intricate lines, our prepress staff may need to add a small stroke to the type. We prefer that our prepress staff handle this correction. Don’t track or kern too tightly. A good rule of thumb: set type loosely and with more leading than you might ordinarily consider. Reverses: we recommend avoiding reverses in general when printing with foil. If you do use type in reverse, use minimum of 10 pt for most fonts. A design with both a reverse and also fine detail can’t be printed in the same press run—we would have to make two separate dies and print those dies in separate runs, resulting in additional cost. Width of lines: lines should be .25 point (or .003”) or thicker. Our pre-press staff will add a stroke if necessary to lines that won’t hold on a foil die. No hairlines! Heavy coverage + intricate details: it’s difficult to print areas of large foil coverage and areas of small intricate details in the same run (and still achieve high quality results). When a piece uses both heavy coverage and light coverage in the same color, we may need to create two dies and run those dies in separate passes, increasing the cost. 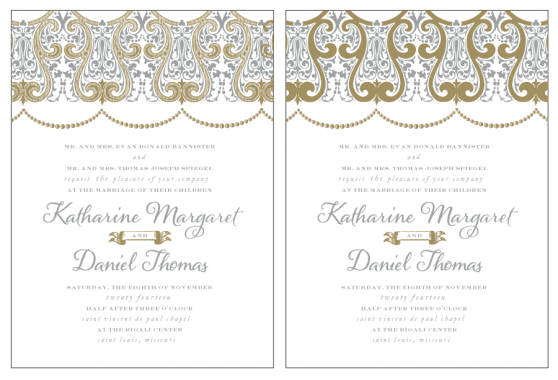 Solid areas: we don’t recommend foil stamping of completely solid areas (100% coverage) that are more than 6 square inches. Don’t overprint, use trapping: do not change your artwork’s appearance to overprint if you’re using foil stamping. We can accomplish the overprinting look by trapping artwork, and our prepress department will apply trapping as needed. We can successfully trap foil to all other printing methods that we offer. Fine lines and detail: we utilize a platemaking process that allows superior results for designs that include fine lines and details. However, there are times where very fine intricate detail may be lost. Thin details work about the same as letterpress printing, except that reverses or thin spaces between artwork tend to fill in. Be sure the space between the lines in the design is no less than half the thickness of the stock that you are using. For example, if you’re using Crane’s Lettra 1-ply (21 points thick), you should have 10.5 pts minimum between lines in your design. Because there are always exceptions to rules, our pre-press staff review all artwork prior to platemaking.